Home Should the ban on Glyphosate continue unhindered? Should the ban on Glyphosate continue unhindered? As the former head of the Rubber Research Institute(RRI), having seen the production figures of both Tea, Rubber and Coconut in the Central Bank report, I was shocked to notice that the Rubber production in the country has dropped down to 69,000 Mt during 2016, compared to over 130,000 Mt produced before 2015, pushing Sri Lanka down to the 12th position among NR producing countries. Situation with regard to other plantation crops including paddy is also the same. Our national rubber productivity has dropped to just over 800Kg/Ha/Yr from 1,300 Kg produced per hectare four years ago. One of the main reasons for this low productivity is the non-availability of the weedicide in order to minimize fertilizer wastage in farm lands and the high cost of fertilizer compared to before 2015. Sri Lanka had a small population half a century ago and the agricultural crops, particularly rice utilized cow dung as the fertilizer and the spraying of extract of Neem leaves or tobacco leaves was sufficient to control the pests. But, the yields were very low and were sufficient to feed the low population in the country few decades ago. Today the availability of farm lands in the whole world, particularly in Sri Lanka has dwindled and hence use of modern techniques to achieve at least four fold increases in productivity of agricultural lands is essential. In Sri Lanka, a sizable amount of foreign exchange earned in the country was used prior to 1977 to import rice to feed the population. Thanks to the diversion of Mahaweli River was undertaken on priority basis to irrigate cultivable land in the dry zone to increase rice production. The use of modern techniques and high yielding rice varieties developed in the world helped us to be self-sufficient in rice until 2016. The developed countries in the world including US produced weedicides like Glyphosate and even the use of genetically modified (GM) high yielding crops to meet the food requirement for the ever increasing human population all over the world. Monsanto Company has developed this weedicide to control weeds in their soya bean farms in mid nineteen sixties to supply Soya bean products to the whole world including to Sri Lanka. However until now, no complaints have been made by the soya bean product consumers in the world of any health related problems such as chronic kidney disease (CKDu) or other ailments caused by the chemical or its residues. Major users of Glyphosate in Sri Lanka are the people working in tea plantations in the hill country and mid country; among them number of CKDu cases reported is insignificant. Further, the Chena cultivators in the North Central province hardly use weedicides and among them CKDu has become an acute problem. Until 2015 in all agricultural and plantation crops in the country, the accepted method of weed control was the application of Glyphosate available in few reputed trade names. Unlike in the case of pesticides used widely for insect control, it must be stated that I have not come across any accidental deaths or suicides reported due to consuming Glyphosate, during my career. But, there are few other weed controlling chemicals still used in the plantation sector are extremely injurious to human health and they are widely used by plantation workers for suicidal purposes. It must also be emphasized here that, even the substitute used now for weed control after banning Glyphosate is far more toxic than Glyphosate. 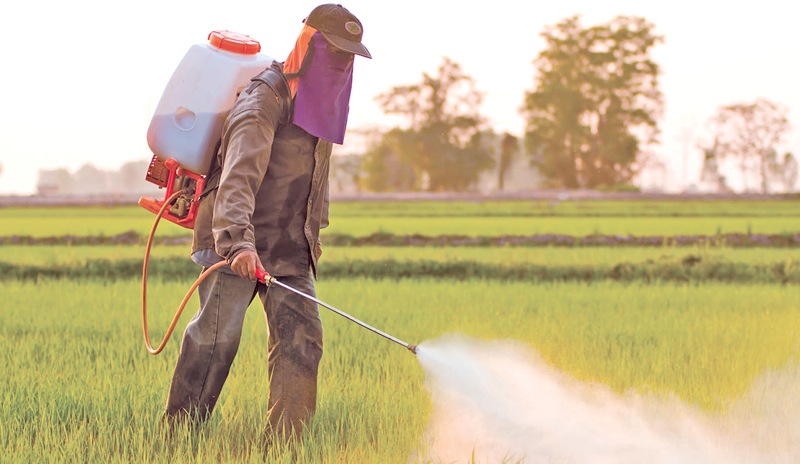 Further, even though it is not so toxic, during the application of Glyphosate, all precautions are taken to prevent any possible effects to the farmers caused due to inhalation of the vapour or skin contact. Glyphosate is the weedicide introduced by US over three decades ago to control weeds in Soya bean farms owned by them, to cater to the whole world. Glyphosate is a systemic weedicide completely killing weeds other than soya been plants from the roots up to the leaves within 8 to 10 days after application; unlike surface weedicides, which kills all green plants soon after application; but grow again within few days, sprouting from the root stock left alive underneath. The sad scenario is that some scientists without much experience and sufficient exposure to agriculture had created an unfounded fear among the public that the cause for the chronic kidney disease (CKDu) spreading in certain provinces in the dry zone of Sri Lanka is the Glyphosate residue accumulated in tanks and reservoirs which are consumed by the people through fresh water fish, vegetables and water. I am sure that none of them have done a survey for the presence of cadmium (Cd) which is a known potential toxic chemical causing kidney disease; present in large quantities in tank water used for drinking by the people living in CKDu affected areas. Cadmium accumulated by grass contaminates milk and also cow dung commonly used by farmers as a fertilizer for fruit and vegetable crops. Hence it is very wrong for them to have mislead politicians’ who are mostly not knowledgeable in scientific subjects to bring in policies like banning the use of Glyphosate in agriculture in the country, thereby making the situation worse for plantations and small scale farmers. Today, you cannot find workers to do sundry work either in plantations or even in farm lands in most remote villages and Glyphosate as a substitute for labour has rendered an invaluable contribution. Recent, wage increase of workers have made the situation even worse for both plantations and farmers, when the price of fertilizers in the market has gone up by over 100%. As an alternative to increased fertilizer price and with the aim of producing health safe Bio rice and Bio vegetables, now, there is a plan to cultivate several thousand acres of paddy lands in the forth-coming planting season using only organic fertilizers (Compost). I only hope that those who give de-ropes to politicians are at least aware of the quantity of compost needed to replace a kilogram of urea or MOP used in a farm? Where are they going to manufacture compost in Sri Lanka and out of what? Are they aware that the compost made out of city garbage was not recommended by research institutes due to the presence of high level of lead in them? Can such high lead containing compost be added to crops like paddy and vegetables? Hence, before making recommendations to policy makers, they must be sure of what they say and should have solid experimental data to prove their recommendations. They must also be sure of the possible yields of such bio farms fed with only compost fertilizer and with manual weeding. Already, the ban of Glyphosate weedicide has created a series of problems in small farms as well as in plantations. From my own experience, manual weeding will only increase the cost of production of agricultural crops; also growth of weeds vastly reduces the fertilizer efficiency of farms due to the absorption of added nutrients to the soil by the weeds. In a comprehensive review published by Prof Chandra Dharmawardene in CDN paper dated 19th April, has given a full report of health effects of glyphosate. Ina similar scientific article published some time ago by Prof Deepal Mathew of Colombo Medical Faculty, has shown by means of the LD50 values that common salt is more toxic to mammals than Glyphosate. Similarly, WHO has done a survey and reported that the use of glyphosate in agriculture is safer than the use of Kerosene oil in domestic lighting in the country. Further, WHO has reported that in order to intoxicate a person at least 8 table spoons of glyphosate containing 40mg per liter of the active ingredient must be consumed. That shows that even the extra precautions taken by the farmers in spraying glyphosate is not essential as the amount of active ingredient in the diluted solution is very little. Taking these things into consideration, the European government has decided to extend the approval granted to use glyphosate in food crop farming until sufficient scientifically proven facts are evident against the use of it. It is my considered opinion that the banning of glyphosate by the government is an illogical and pre-mature judgment taken at the expense of the economy. In scientific articles, it has been reported that cadmium metal in drinking water definitely affect kidneys of those who use contaminated water and hence the public in the NCP of Sri Lanka must be aware of this fact. When the WHO carried out a health survey in Sri Lanka jointly with local doctors, they have observed high levels of cadmium in the urine of the CKD affected patients. If that is the case, sources of high cadmium containing precursors must be banned in Sri Lanka. If this is the case, can the government recommend the use of Eppawala Rock Phosphate (ERP) containing 25 ppm of Cadmium in fertilizer mixtures? Hence, taking these scientific facts into consideration, why not educated politicians and ministers with scientific back ground and advise the President and the Prime Minister to remove the ban on the use of Glyphosate in all sectors of agriculture in Sri Lanka, at least to reach our crop productivity figures reported before 2015 level to save the country from a mass hunger if, a world war erupt in the future. Policymakers should not blindly get carried away by the half-baked scientific facts given by the scientists inexperienced in agriculture backed by the cheap publicity seeking politicians about these chemicals which are essential for the food and industrial raw material production of the country. By way of a reply to Ranasinghe’s article, finally I must say that the Rubber Plantation sector too had a devastating impact as a result of the ban of the Glyphosate and the low productivity is one of the banes of this ill-conceived ban.